1. A small, baked pastry that is round in shape with a shallow wall around the entire base. 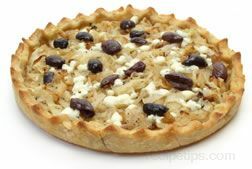 Typically a Tart is made with a pastry dough that is light and flaky or a shortcrust that is dense and crumbly. 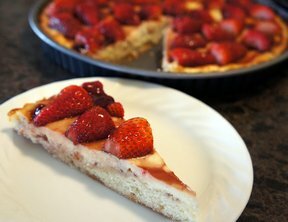 It is made to be served as an open crust containing sweet fillings such as fruits, custards, or creams, as well as savory fillings that are most often served warm. Each Tart is made to be filled and kept open without a top crust. Similar in meaning, a pie, a flan, a quiche, a tartlet, a tarte, or a tartelette all have an appearance and structure that is basically the same as a Tart. A Tartlet, which may at times be used in reference to a Tart, is a term that applies to a smaller-sized Tart. The Tartlet may be a single, bite-sized version of a larger Tart such as an appetizer, or it may be a pastry larger than a bite size piece that is made as an individual dessert serving. When the Tart is made as a large pie-like food it then is prepared so numerous individual servings can be sliced from the whole Tart. When prepared, the Tart may be blind baked, in order to first prepare the shell and then fill it with cold ingredients to be served as a cold food. Or, the Tart may be filled prior to baking so the filling and the shell bake at the same time. While the Tartlet is most often served as an appetizer or a small serving for dessert, the Tart is often served as a larger piece of dessert or as a slice for a main meal. 2. A sharp, sour or acidy taste that is provided by fruits such as lemons or cream products such as sour cream.